We hope you will join us as we march to Washington’s state capitol on Monday, January 21st, MLK Day, to impress on our state legislators the need for laws which alleviate our community’s suffering from poverty, unjust immigration enforcement, homelessness, lack of access to nutritious food and inequality. We will be holding a candlelight vigil on the capitol steps. As we enter a new year, with those who rely on governmental checks living in fear of losing everything, we will continue POWER’s important work of building a community that raises awareness and supports one another to advocate for our rights. We hope you are able to make a donation of time or money to support our work. In 2018 we continued to provide information to members through our advocacy hotline, fueling our frustrations with a system that provides families with benefits that are 30% of the federal poverty level while finding the funds to pursue a fraud case against a single mother of 5. We provided welfare witnesses to a family with a CPS home visit, a mama with an intimidating landlord and a pregnant woman with a doctor she felt looked down on her because she was low income and disabled. We supported a mother who is not only taking care of her own children, but their CPS placed siblings, who was denied benefits for those children! She won her hearing and the subsequent appeal by DSHS. We held our monthly POWER Outage with skill shares on crafting, gardening, labor history and telling our stories. We had speakers from the Missing Middle, Thurston Housing Land Trust and the Washington Anti Hunger and Nutrition Coalition. We held our annual Mama Care Fair in May, our cook out in August and our Voter Roundtable in November. Alchemilla, our Feminist Economic Collaborative, continues to maintain a co-share office space and art gallery at POWER, created fun spring and fall Arts Walk events and a Winter Bazaar, while holding a weekly pop up market over the summer and fall. Alchemilla partnered again with Helsing Junction Farm to provide affordable CSA (Community Supported Agriculture) fruit and vegetable boxes which could be purchased with food benefits through their cooperation with the Farm Fresh Food for Healthy Kids study. POWER is having a busy December. Start the season off right! Join us TODAY at 3:30 and make some crafts. Bring snacks if you can! Join us at our regular Board meeting to welcome new candidates and vote for POWER’s 2019 Board. Every year POWER organizes a community march to the Capitol on MLK Day. Join us to help make this year’s march fantastic! November POWER Outage is as always the Voter Roundtable! Discussion from 6 – 8. Share what you know about candidates and issues. Learn from your neighbors. Bring your ballots. We’ll provide stamps. Bring the kids, we’ll have childcare. 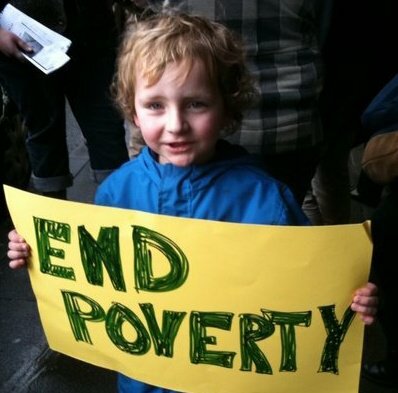 POWER is an organization of low-income parents and allies advocating for a strong social safety net while working toward a world where children and caregiving are truly valued, and the devastation of poverty has been eradicated. Come out for food, fun, and fellowship with the WA Poor People’s Campaign. We will come together and learn about the issues facing our communities and the candidates that are up for election. Please feel free to bring your ballots and fill them out there if you wish. This is a non-partisan gathering. You are welcome to bring a dish to celebrate this important time in our history. 1. Message from the Children’s Alliance – Vote for Kids! 2. Glen Morgan plays dirty politics in this election and in past. 3. Call to action – Submit a public comment opposing Trump’s immigration policies. 4 and 5. Spend Saturday in downtown Olympia – 2 great events – Olympia Food Co-op Annual Meeting and Stonewall Youth Dance Party. Ballots for the 2018 midterm elections have arrived and voting is happening now. The decisions that Washington state voters make this election will have lasting consequences for our kids. There are four statewide ballot measures that are critical for kids (gun safety, climate justice, local public health funding, and law enforcement training). 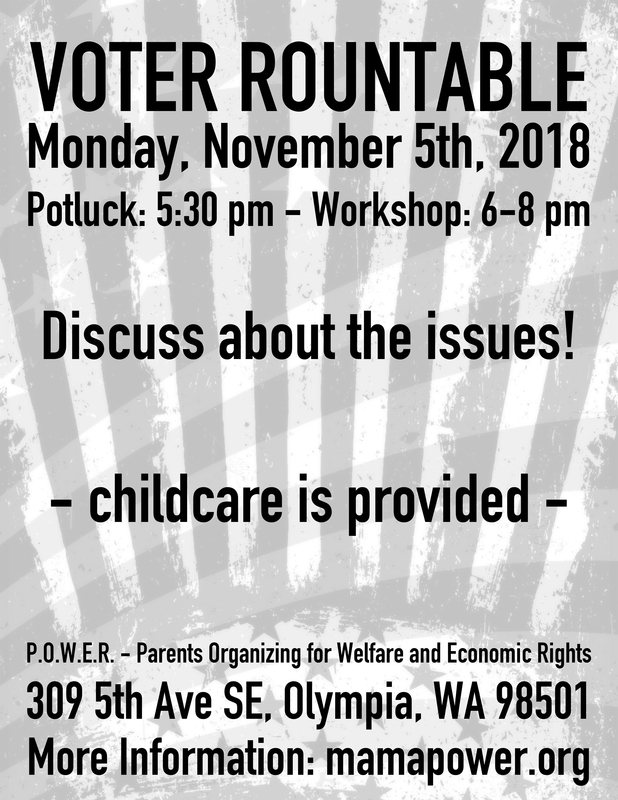 After the election, no matter the outcome, Children’s Alliance will be here to serve the mission that has guided us since 1983, demanding that Washington policymakers put public policy on the side of kids! Thank you for speaking up for kids and families. P.S. Election Day is November 6th. Get the Voter’s Guide: http://www.sos.wa.gov/elections/. Come to the P.O.W.E.R. Outage this Labor Day for Potlucking and Empowerment! We will start with a mingle and potluck then a casual brief overview of the history of Labor Day on a national and local level, followed by a discussion and possible presentation about Unions, ending with a deep discussion about personal work, values, and actions for change. During the Labor Day festivities there will be a childcare dance party or craft fun for kids all provided by P.O.W.E.R.! This is open to anyone and absolutely FREE! Bring a dish if you can and come join us for some real talk about labor empowerment! Olympia City Council will consider the Missing Middle. Public comments submitted to missingmiddle@ci.olympia.wa.us will be forwarded to the City Council. SEATTLE – People in cities across the country on Tuesday commemorated the 55th anniversary of the March on Washington, when Dr. Martin Luther King Jr. gave his famous “I have a dream” speech. The congregation of Mt. Zion Baptist Church along with members of the community came together to commemorate the March on Washington, and also used the event to kick-start the campaign for I-1000, an initiative to re-legalize affirmative action in the state. “Today the struggle for racial equality continues,” said one church member. Dr. King spoke at Mt. Zion Baptist Church in 1961 when he was in Seattle. “It’s important to take stock of the moment we’re in right now and also the place that we’re standing,” said Eric Liu. People standing at the event were also holding signs encouraging other to support Initiative 1000, which they hope to get on the ballot. “If Doctor King was alive today and if he was in Washington state, what would he do? And they decided it would be the repeal of I-200 and the birth of I-1000 to actually bring diversity back to Washington state that was taken 20 years ago,” said former state Rep. Jesse Wineberry, who also serves as honorary chair of the I-1000 campaign. I-1000 is aimed at repealing I-200, which was a measure approved by voters 20 years ago changing state law to prohibit government from discriminating or granting preferential treatment to anyone based on race, gender or ethnicity. “It has been tolerated for 20 years. You have to start somewhere and this was a good start today and to remember how far we’ve come and how far back we’ve gone, and in ’63 we didn’t have civil rights,” said Eddie Rye Jr. Backers of I-1000 need to gather 300,000 signatures by the first week of January. Lawmakers have introduced bills in the past to re-legalize affirmative action, but have been unsuccessful. The life of Yvonne McDonald was honored and remembered by family, friends, and community members at West Central Park in Olympia Thursday night. McDonald’s death on August 7 under suspicious circumstances has shocked the community. Hundreds of people, many bringing bouquets of flowers, filled the park on the corner of Harrison and Division in west Olympia. As the sun went down, candles were lit, hugs were shared, and stories about McDonald were told from the heart. McDonald, 56, was found alive and partially clothed with significant injuries to her body on Olympia’s westside the morning of August 7. At about 7 a.m., Olympia Police and the Olympia Fire Department were dispatched to a report of a woman lying in the yard of a private residence in the 900 block of Division Street NW. According to a press release, fire personnel provided immediate medical care to McDonald and she was transported to St. Peter Hospital. There, she received further medical treatment but died that evening at the hospital. She described McDonald, an African American woman, as a ball of energy who knew how to draw a crowd and stand up to bullies. Born in Houston, Texas, she lived in Washington State for over 40 years. McDonald valued education and instilled her beliefs into her many family members and nieces, many of whom spoke at the vigil. Reed said McDonald was known to talk a lot and would debate anything, a comment which elicited laughter from family members. “She liked to be heard, and that was ok, because of what she stood for. It was amazing….She didn’t have kids, and I wanted to be just like her. “Yvonne taught me to push forward…and persevere, liking what you do and how you do it. My aunt embraced her beauty, her African American culture, and her intellect…she was beautiful,” said Reed. McDonald had worked for several state agencies, including the Department of Ecology and the Department of Employment Security. She also worked for the Sentencing Guidelines Commission and South Puget Sound Community College. She received her Masters of Public Administration from The Evergreen State College. One of her faculty professors, Peter Bohmer, said he learned from McDonald as much as he hoped she learned from him. She was his student in the master’s program in the fall of 2000. Bohmer said she was an independent thinker, an outstanding student, and the most outspoken in class. He said one of her favorite books was The People’s History of the United Statesby Howard Zinn. “She would know paragraphs by heart, particularly about labor movements, civil rights, and reconstruction. She had really, really strong views, particularly about economic and racial justice. She was a big believer in labor movements as helping improve the dignity of all people,” he said. Bohmer said she later worked as an organizer for unions. They maintained their friendship until her death, enjoying deep conversations. “Yvonne McDonald will be missed. Yvonne McDonald presenté,” he said. Lanessa Inman, racial justice director of YWCA Olympia, thanked the community for holding space in support of McDonald and her family. 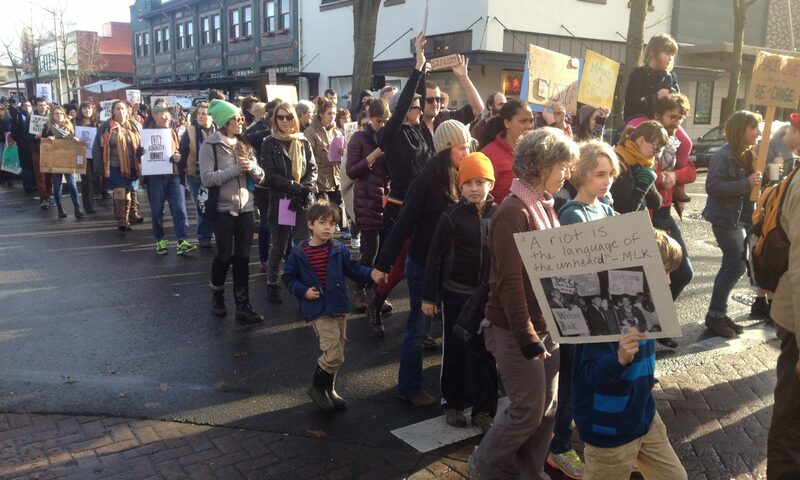 YWCA Olympia has a mission of eliminating racism and empowering women. “Yvonne’s life deserves justice…this (vigil) needed to happen,” said Inman. She said her heart sank when she first heard the reports of what happened. “Black women, brown women, and indigenous women are murdered or disappear or just vanish. They are silenced and there is complacency, and we were adamant that that would not happen….We have a lot of work to do in this community,” she said. In a written statement issued earlier this week,Olympia Police Department Chief Ronnie Roberts said the death of McDonald has raised many concerns and questions in the community. “When a member of our community dies under suspicious circumstances, it leaves us all shaken and understandably in need of answers. There is currently much that we do not know and cannot know yet. There is also information that we will not share out of respect for Ms. McDonald’s family and her personal and medical privacy,” said Roberts. Olympia police detectives have been assigned to the case and Roberts said the detectives are in communication with members of McDonald’s family. The Thurston County Coroner’s Office conducted an autopsy and the results are pending. The coroner has not yet determined the cause of death. A Facebook site, Justice 4 Yvonne, has been established. Fundraising efforts in support of the family for expenses related to McDonald’s death are also underway. This week, Senator Cory Booker (D-NJ) introduced the “Simplifying Financial Aid for Students Act” that would streamline the financial aid process by making it easier for more low-income students to apply—and qualify—for federal student aid. As college costs continue to rise, Congress must work to make a postsecondary education or credential more accessible and affordable for low-income students. The bill would increase the automatic zero Expected Family Contribution (EFC) income threshold to $36,000, allowing more low-income students to be eligible for a maximum federal Pell Grant to help cover their college costs and basic needs. The legislation would further improve college access by allowing applicants who have received benefits from a means-tested federal program to qualify for an automatic zero EFC and a maximum Pell Grant. The bill also permits higher education institutions to use information from students’ Free Application for Federal Student Aid (FAFSA) forms to reach out and counsel them on eligibility for outside scholarships or other means-tested programs—such as Supplemental Security Income (SSI), Supplemental Nutrition Assistance Program (SNAP), Medicaid, Temporary Assistance for Needy Families (TANF), and Special Supplemental Nutrition Program for Women, Infants, and Children (WIC). CLASP strongly supports these provisions. The bill allows students to use income data from the second preceding tax year to apply for financial aid through a streamlined data match between the U.S. Department of Education and Internal Revenue Service and strengthens the IRS data retrieval tool. Importantly, the legislation provides federal financial aid eligibility to Dreamers—undocumented students who came to the United States as children—enabling them to afford the cost of college and pursue their career aspirations. CLASP strongly supports this provision, as well as the Dream Act (S. 1615/H.R. 3440), which would put undocumented immigrant youth who meet certain requirements on a path to citizenship. The bill also eases and streamlines the verification and determination process for homeless and foster youth. Under the bill, the U.S. Department of Education (ED) must develop a single, easily understood screening question to identify homeless or foster youth applicants and make it easier for them to access federal student aid. Importantly, the bill clarifies that youth under age 24 who are determined to be homeless are considered independent students and can get the financial aid they need. Finally, the bill eliminates unnecessary and burdensome questions on the FAFSA, such as the applicant’s criminal history, and makes the application more accessible to English learner students and their parents. Under the legislation, ED would be required to work with the U.S. Census Bureau to determine the most common languages spoken at homes in the United States and develop versions of the FAFSA in those languages. The Center for Law and Social Policy (CLASP) applauds Senator Booker’s leadership in championing college access and affordability and helping low-income students move along pathways out of poverty. As Congress considers reauthorization of the Higher Education Act (HEA), we look forward to working with Senator Booker and other members of Congress to adopt student-focused HEA reforms that strengthen federal grant aid, increase supports to low-income and working students, and streamline the financial aid process to benefit low-income students. As the U.S. House and Senate reconcile two very different farm bills, formerly incarcerated people are at risk of losing Supplemental Nutrition Assistance Program (SNAP) food assistance. Representative George Holding (R-NC) filed a troubling amendment that was adopted in the House farm bill. It would impose a lifetime ban on SNAP for returning citizens convicted of certain violent felonies. The ban would apply regardless of when the crime was committed, sentence completion, and compliance with terms of release. The amendment would also impact the families of the formerly incarcerated. Despite being banned from SNAP, their income would still count toward household income when determining benefit levels. This could markedly reduce assistance for those who live with returning citizens, especially their children who are particularly vulnerable due to loss of financial support. Each year, 650,000 people are released from state and federal prisons. And more than 4.5 million people are under some form of community supervision, including parole or probation. Withholding food assistance would exacerbate the challenges returning citizens face during reentry. Among others, these include being turned away from public housing; limited education and workforce training opportunities; and unstable access to reliable healthcare. Often, the biggest challenge is finding employment. Nearly half of all employers review applicants’ criminal history. It’s not surprising, then, that 76 percent of formerly incarcerated people describe finding work as “very difficult” or “nearly impossible.” And despite low unemployment nationally, over 27 percent of formerly incarcerated people are unemployed. As a result, they often struggle to put food on the table without SNAP assistance. According to the National Institute of Health, 91 percent of returning citizens experience food insecurity—a magnitude which resembles that of developing countries. Lack of food access increases the likelihood of recidivism, but providing food assistance has been shown to thwart such odds. A Harvard Law School study found that SNAP, along with cash assistance, reduced by up to 10 percent the risk of recidivating within one year. Returning citizens’ challenges are part of a larger systemic problem. These individuals are primarily from low-income communities and communities of color that have historically been marginalized by public divestment. Inconsistent policing practices, bail policies that encourage plea bargains, and underfunding public defenders all contribute to the overrepresentation of these populations among returning citizens. Banning them from food assistance when they return home reinforces this inequitable pattern. CLASP opposes the inclusion of the Holding amendment in the final farm bill. While formerly incarcerated people have made mistakes, they and their families shouldn’t be subjected to permanent punishment. They aren’t less deserving of food assistance than anyone else. As a society, we should see them as individuals who need compassion as well as the opportunity to successfully rejoin society and live their lives with dignity.